Cardboard RoboCop Cosplay #ElectronicHalloween « Adafruit Industries – Makers, hackers, artists, designers and engineers! Comicbookgirl19 put together this fantastic cardboard and papercraft cosplay RoboCop, love the subtle spinning flame at the end of the weapon! HAPPY HALLOWEEN! 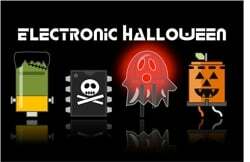 Each weekday this month we’ll be bringing you ideas and projects for an Electronic Halloween! Expect wearables, hacks & mods, costumes and more here on the Adafruit blog! Working on a project for Halloween this year? Share it with us on Google+, in the comments below, the Adafruit forums, Facebook, or Twitter— we’d love to see what you’re up to and share it with the world (tag your posts #ElectronicHalloween). Tune in to our live shows, Wearable Electronics with Becky Stern and Ask an Engineer, where Adafruit store discount codes are announced– get the most bang for your Halloween buck!